Καλώς ήρθατε και πάλι, Elvira’s! The extended Elvira’s family threw a party this afternoon, to celebrate their re-opening after an extended remodeling. 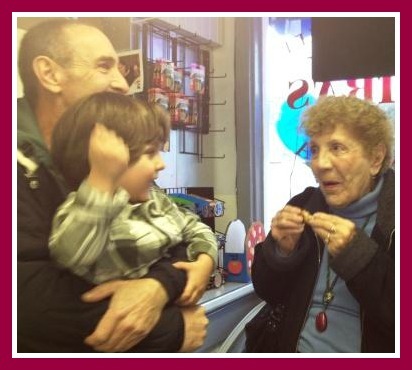 But it was hard to tell who was smiling more: the Yiozanakos family, who have owned the popular deli/grocery store/pizzeria/community center for 15 years, or the hundreds of Old Mill/Compo Beach residents who rely on it for breakfast, lunch, dinner, snacks, conversation, gossip, and a “Cheers”-type ambience where everyone knows your name (and and knows everything important about you). Welcome back, Nick, Nicki, John, Stacey. And congratulations — the place looks better than ever! Nick and Nicki Yiozanakos are all smiles in the new Elvira's. 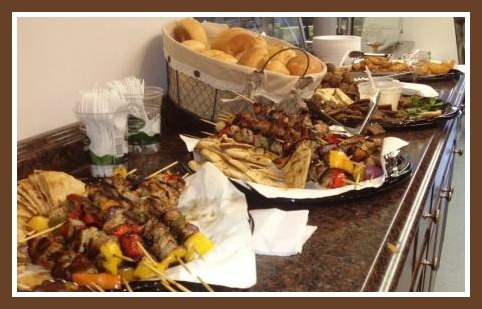 Gyros, kebabs, pizza -- it was all there and more for the Elvira's crowd. Note the handsome new cabinets! Elvira's fans of all ages enjoyed today's party. 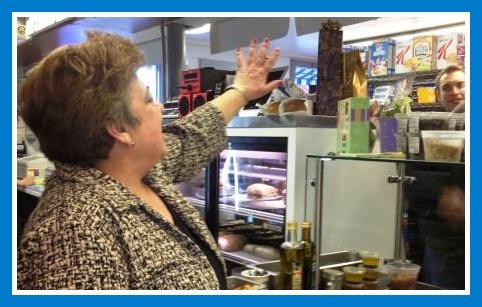 Stacey Yiozanakos waves to one of her many customers/friends, from behind the counter. 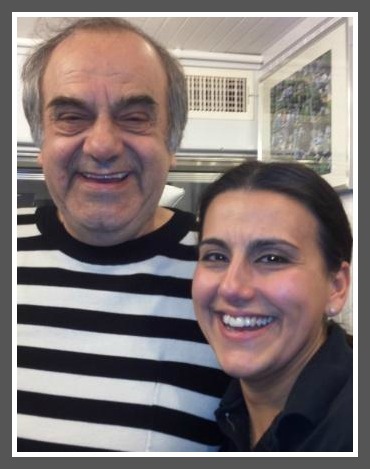 This entry was posted in Beach, Local business, People and tagged Elvira's, Yiozanakos family. Bookmark the permalink. The hosts with the most! A wonderful party. It was our pleasure tonight!!!! Thank you all for coming!!! Lots of love from the Elviras Family!!! And thank you Dan for stopping in!!! Do you have anything against dogs?? Your wastebaskets have signs stating not to deposit dog droppings. I can’t speak for Niki. But I think it may be because those garbage cans are right next to where people sit and eat. No actually we really dont Have a problem with dogs but like dan said people complain about the doggy poopy smell when they eat!!! I think of it this way i dont think anyone would appreciate me putting my daughters diaper in there kitchen garbage! So in respect to my customers i would appreciate no dog waste in the garbages! As far as dogs they are always welcome to even drink out of the cute dog bowl outside the store front! But thanks that was pretty funny! Seriously dog people…. as the saying goes…. Don’t S4!T where you eat….and especially don’t put S4!T where others eat….. The dog pan of water is there how much more dog friendly do they need to be…. Then move the picnic tables further away from the garbage cans! Not a lot of space. Go down there and see if you can figure out a solution. And stop in and say hi to the very friendly (to people AND animals) crew that owns, works in and loves the store, and the neighborhood.